Uzbekistan’s highly decorated armature standout, Murodjon Akhmadaliev, a 2016 Olympic Bronze Medalist in the bantamweight division, has arrived in Las Vegas to start his professional boxing career, alongside fellow countryman and Olympic teammate, Shakhram Giyasov. 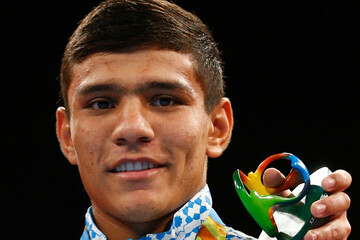 Akhmadaliev, age 23, will have every opportunity to become a big star in the United States. His aggressive style is sure to be fan-friendly, as was the case when he floored Ireland’s Gold Medalist, Michael Conlan, in the 2015 AIBA Men’s Boxing World Championships. Akhmadaliev, a southpaw with power in both hands, believes his style will suit him well as a professional. Training Akhmadaliev, will be Justin Gamber, best known for his role as head coach of undefeated super-middleweight contender, Caleb “Sweethands” Plant (16-0, 11 KOs). Gamber feels Akhmadaliev has the talent to be a force in the featherweight division. Both Akhmadaliev and Giyasov are promotional free agents, but are sought out be several U.S. promoters.